What if I told you that you could have the scent of California’s summer breezes in a bottle with you, any time, any where? If you’re anything like me, you’re midway through reaching for your wallet as you read this sentence. I am so obsessed with this product, I cannot wait to share South of Monterey Environment Spray by The Village Common with you. I met formulators/owners Ben and Blake about a year ago at the Indie Beauty Expo (my favorite gathering of beauty products ever). And in the sprawl of products as far as the eye can see, I was instantly drawn to The Village Common set up. Their line is intoxicating: Candles, room sprays and perfumes, each line designed around iconic American landscapes: Appalachia, Highland Dell, and Chisos to name a few. I instantly loved how passionate Ben and Blake are about their line. There’s something to be said for formulators who are devoted to their products – And in many ways this is a family business. Ben and Blake are not related, but their family histories led them to create a line of beautiful scents and products. 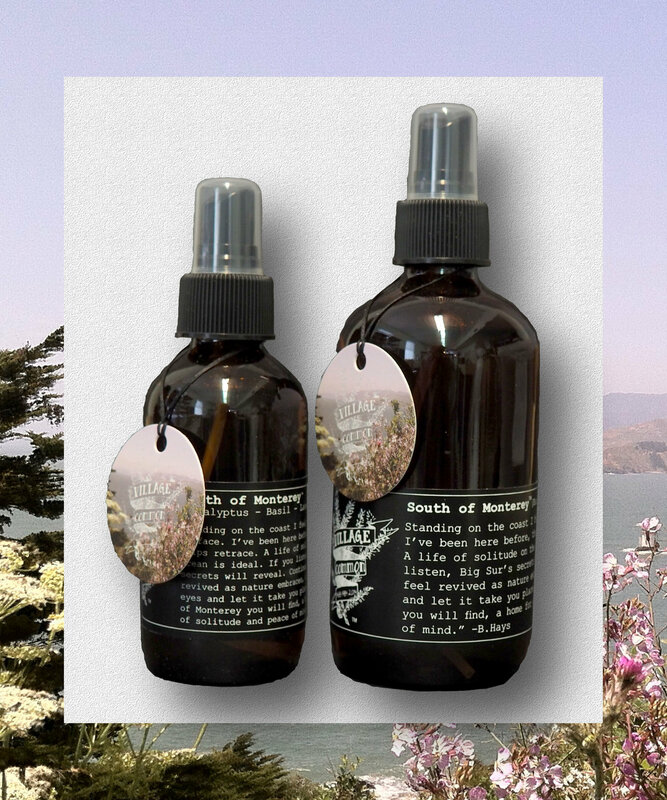 I’m all about the South of Monterey Environment Spray – It’s an essential oil blend (*insert thumbs-up emoji here*), which I love that combines basil, eucalyptus and lavender for a gender-neutral scent that just resonates with me. I’ve been using this blend on my pillows and sheets recently, and my whole family is obsessed. Just a few light spritzes really makes a difference. And, I just learned that The Village Common has a new line of candles – The Garden Collection that features scents like basil, oregano and geranium. I only have four words, Ben and Blake: Hook. A. Girl. Up. I haven’t tested the Garden Collection yet, but if it’s anything like their American Landscapes line, it’s perfection in a candle. I think The Village Common makes PERFECT gifts for anyone on your list. Confession: I have a small collection of Village Common products that I purchased just to give away as hostess gifts when I go over to a friend’s house. Check out the button below to learn more about every line and product from Ben, Blake and The Village Common. If only the internet was scratch and sniff ….